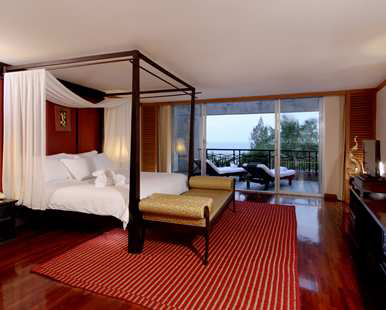 Our King Deluxe Room offers us an unforgettable stay on our honeymoon in paradise. This contemporary Thai-style room boasts a mini bar, a 32-inch LCD TV, a seating area with a sofa-bed, a king size bed with luscious bedding, bathrobes and slippers, a separate bathtub and shower, and lavish bath amenities. Our beachfront retreat also includes a balcony with spectacular sea views. In the bright and airy settings of the King Bay Room, we will sit back, relax and enjoy sparkling ocean views. This spacious, beachfront room boasts contemporary, Thai-style décor, a mini bar, a 32-inch LCD TV, a seating area with a sofa-bed, a king size bed with luxurious linens, bathrobes and slippers, a separate bathtub and shower with lavish bathroom amenities. 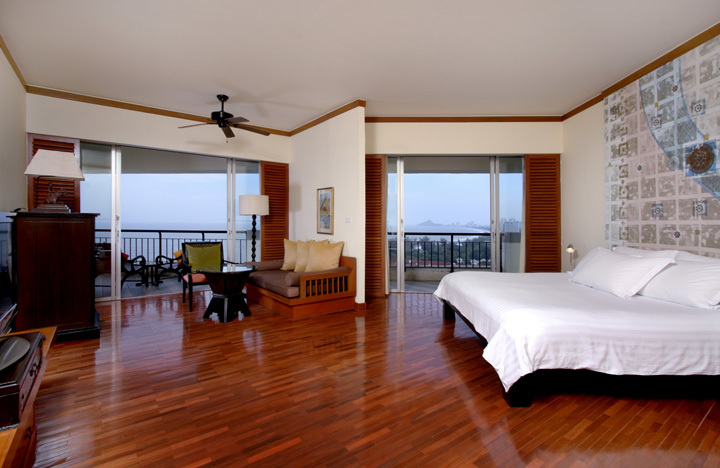 Outside on our private balcony, we will take in the spectacular views of the Gulf of Thailand! 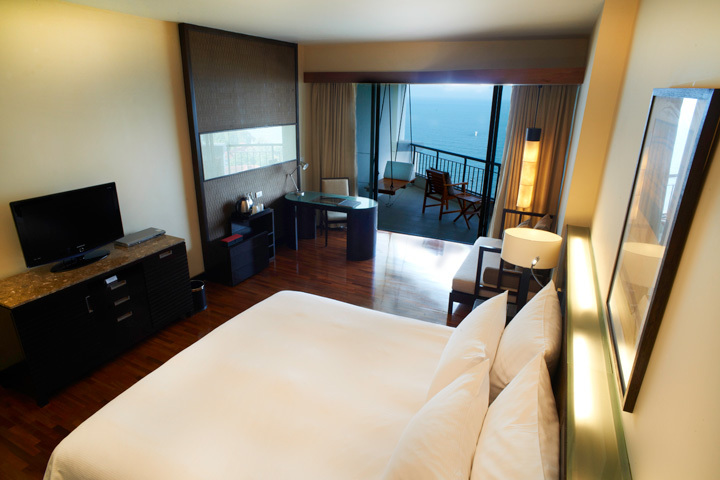 We will take delight in the charming settings of the King Gulf Room on our honeymoon at Hilton Hua Hin Resort and Spa. Our soothing sanctuary boasts a contemporary, Thai-style décor, a mini bar, a 32-inch LCD TV, a seating area with a sofa-bed, a king size bed with luscious linens, bathrobes and slippers, a spacious bathroom with a separate bathtub and shower, and luxurious bathroom amenities. Outside on one of the two private balconies, we will make a toast to our new lives together and admire breathtaking ocean views. 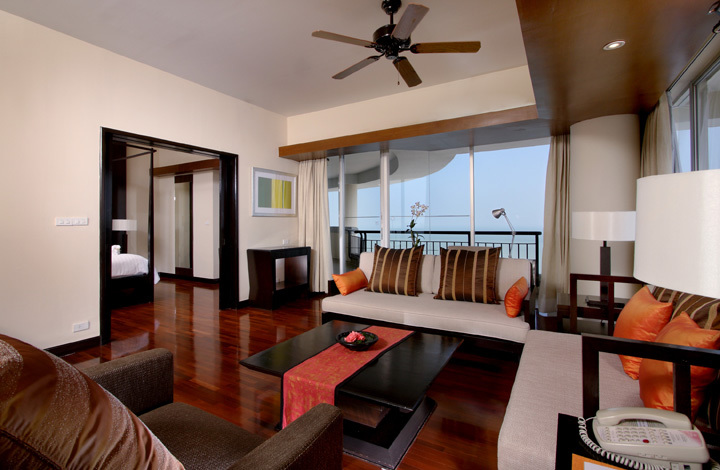 At Hilton Hua Hin Resort and Spa, we will enjoy a stay in the Ayuthaya Suite on our honeymoon. This honeymoon haven boasts Resort Club Lounge access offering continental breakfast with hot a la carte options, refreshments throughout the day and complimentary internet access. A welcome amenity, a large plasma TV, a king size bed with luscious linens, plush bathrobes, a marble bathroom with a separate bathtub and shower, and bath amenities including aromatherapy bath oils. Outside on our private balcony, we will admire mesmerizing views of the ocean and beyond! 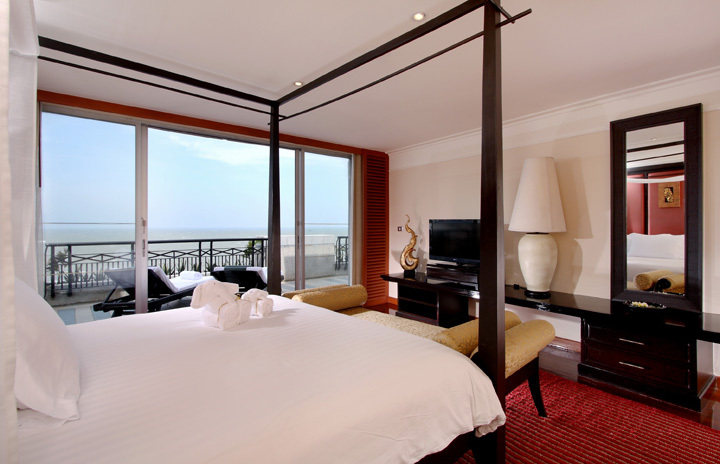 The King Executive Suite will enhance our honeymoon stay with special touches and stunning ocean views. Our romantic retreat promises us Resort Club Lounge access offering continental breakfast with hot a la carte options, refreshments throughout the day and complimentary internet access. A welcome amenity, a kitchenette, a mini bar, dining table and chairs, separate living room, a large plasma TV, a king size bed with luscious linens, plush bathrobes, a marble bathroom with a separate bathtub and walk-in shower, and bathroom amenities including aromatherapy bath oils. Outside on our private balcony, we will make a toast to our honeymoon in paradise while taking in the views of the ocean and beyond! On our romantic honeymoon we will enjoy a stay in the King Pacific Suite. This stunning suite offers us Resort Club Lounge access including continental breakfast with hot a la carte options, refreshments throughout the day and complimentary internet access. A welcome amenity, a kitchenette, a mini bar, a wet bar, a full-size refrigerator, dining table and chairs, separate living room, a large plasma TV, a king size bed with luscious linens, plush bathrobes, a bathroom with a separate bathtub and walk-in rain shower and bathroom amenities. We will create unforgettable honeymoon memories while witnessing panoramic sea views from one of the two balconies. A stay in the Sukothai Suite is a wonderful wedding gift for our honeymoon at Hilton Hua Hin Resort and Spa. Our suite offers us Resort Club Lounge access including continental breakfast, refreshments throughout the day and complimentary internet access, a welcome amenity, a full-size refrigerator, dining table and chairs, a large living room, a pantry, a large plasma TV, two bedrooms with king size beds with luscious linens, plush bathrobes, a marble bathroom with a separate whirlpool bathtub and shower, and bathroom amenities. Outside on the private balcony, we will create unforgettable honeymoon memories while witnessing panoramic sea views. We will be pampered with the special touches of the King Executive Room on our honeymoon. This luxurious room offers us Resort Club Lounge access including continental breakfast with Hot a la carte options, refreshments throughout the day and complimentary internet access, a mini bar, dining table and chairs, a seating area, a 32-inch LCD TV, a king size bed with luscious linens, plush bathrobes and slippers, separate bathtub and shower, and bathroom amenities. Outside on the spacious balcony, we will admire breathtaking sea views. With your wonderful wedding gift, we will enjoy a stay in the King Gulf Executive Room. This soothing sanctuary offers us Resort Club Lounge access including continental breakfast with hot a la carte options, refreshments throughout the day and complimentary internet access. Thai-style décor, a mini bar, dining table and chairs, a seating area, a 32-inch LCD TV, a king size bed with luscious linens, plush bathrobes and slippers, separate bathtub and walk-in shower and bathroom amenities. Outside on one of the two spacious balconies, we will make a toast to our new lives together! Our honeymoon in paradise promises us pure indulgence! We will relax on a poolside sun lounger under the shade of an umbrella at the Aqua Pool Bar and Sunset Beach Bar. We will cool down with a refreshing drink from the extensive menu of alcoholic and non-alcoholic drinks or choose from the fantastic range of tropical cocktails made with fresh fruits. So much more than just a bar, the Hua Hin Brewing Company serves the finest cuts of steak and a range of tasty favorites including juicy burgers and barbequed skewers. We will relax with a cold drink and savor the famous pork knuckles. We will enjoy live bands in the evening or relax with a drink as we listen to guest DJs into the night. 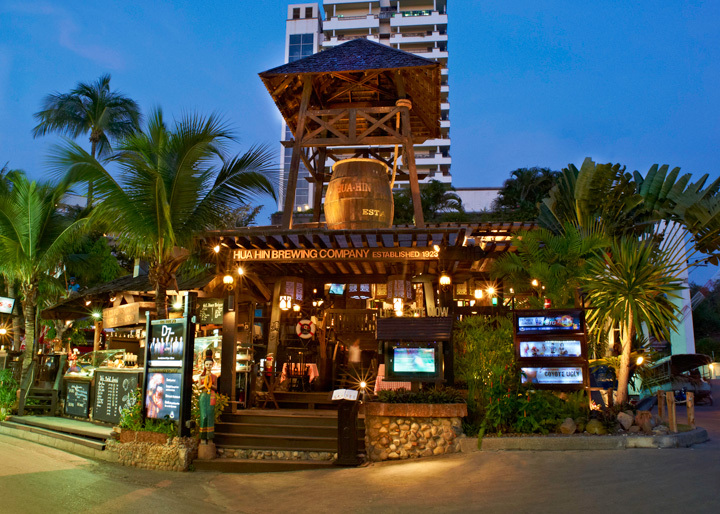 Here, we can also catch up on all the latest sporting action on the big screen TV at SOS Tugboat Bar, the open-air beer garden connected to the Hua Hin Brewing Company. We will relax on a comfy sofa in this lounge bar and stay entertained with live music from the house band as they perform a range of classic and international hits. An extensive cocktail and snack menu is also available for our indulgence. At the relaxed Market Restaurant, we will sample International or Thai delicacies on our tropical honeymoon. 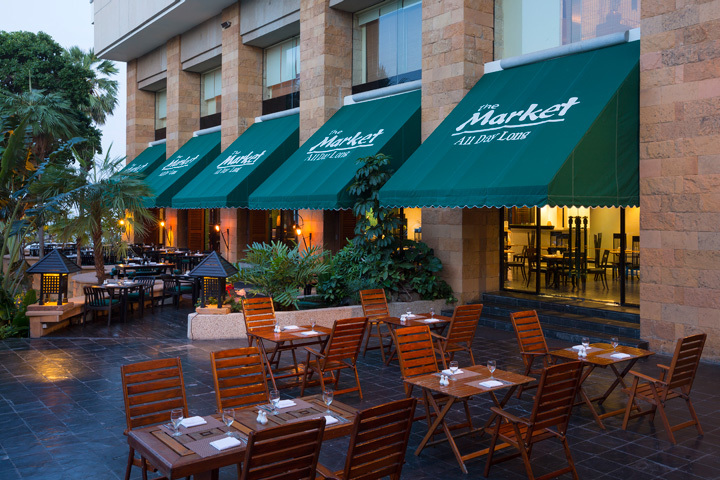 We will dine al fresco on the beautiful outdoor terrace and enjoy a taste of the Mediterranean with Italian wood-fired pizzas and traditional antipasti. The White Lotus Restaurant offers us an exquisite dining experience. We will savor delicious Szechuan and Cantonese dishes from the 17th floor rooftop restaurant. 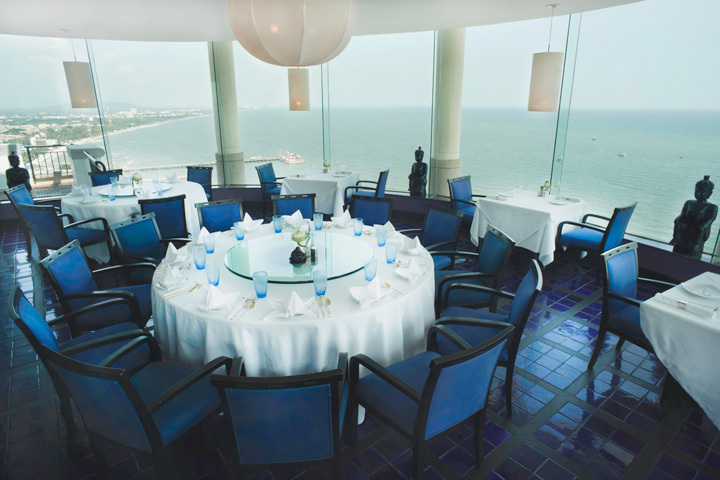 We will choose the outdoor seating for panoramic views of the Gulf of Thailand and surrounding mountains! 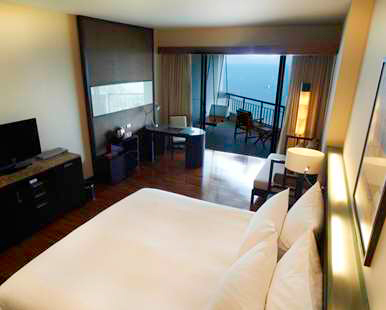 At Hilton Hua Hin Resort and Spa, we will shop around to bring a piece of our honeymoon home with us. We will browse around the gift shop in search of honeymoon keepsakes. From beautiful pieces of artwork, stylish accessories, apparel and jewelry, to locally made products and souvenirs, we will find just what we wanted and cherish these treasures in the many years to come! 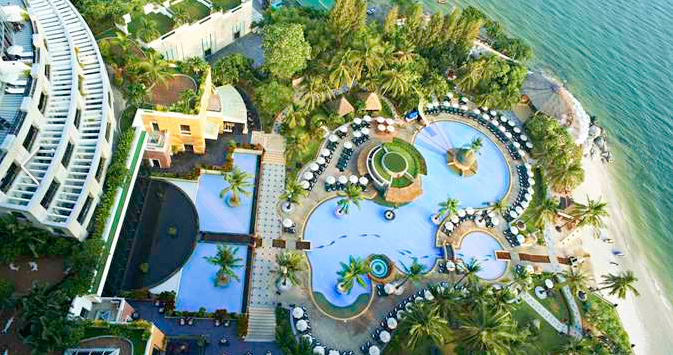 On our romantic honeymoon, we will escape to the Hilton Hua Hin Resort and Spa, situated in the center of Hua Hin, Thailand. This romantic haven boasts a variety of restaurants and bars offering savory dishes and drinks, on-site activities, an array of massage options, facials, body rituals and other treatments in the spa. Hilton Hua Hin Resort and Spa promises us the honeymoon of our dreams! Situated in the center of Hua Hin, the Hilton Hua Hin Resort and Spa provides the perfect combination of bustling urban life and relaxed seaside living. 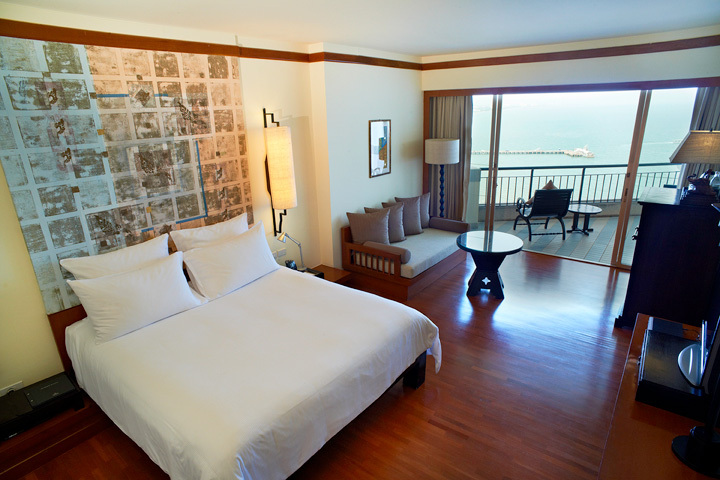 Stunning accommodations all offer panoramic views of the Gulf of Thailand, special touches and lavish amenities. We will sit back and relax on a sun lounger, sip a tropical cocktail from the pool bar and bask under a cloudless sky. For an intimate experience, we can indulge in a romantic meal, choose from fresh local seafood and outdoor fine dining, enjoy live music over drinks or experience a world of peace and calm in the spa. 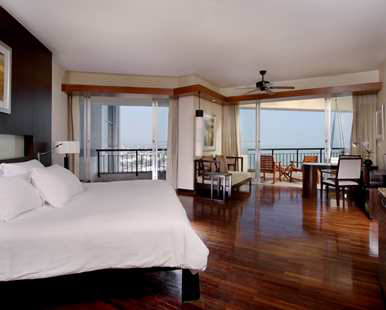 At this beachfront hotel, our honeymoon will be enhanced with the exotic elegance of Hua Hin and its exotic location. This is ideal for the most sensitive of skin types. I will receive a soft deep-cleansing seven seas body scrub to revive dull skin and leave my body feeling vibrant and tingling. Next, an application of soothing body lotion will complete my invigorating experience. Using local and natural Thai fruits, this body-reviver will enhance and replenish tired muscles and leave my entire body soft and smooth. Wrapped in warm towels, I will feel a true sense of rejuvenation. On my honeymoon I will enjoy an array of activities under the sun but I will need the Sunburn Reviver to help moisturize my sun-drenched skin. The healing powers of pure, fresh aloe vera and cucumber are used to cool, soothe and hydrate my skin. I will receive a relaxing and therapeutic foot and scalp massage while receiving my treatment. I will emerge feeling calm and refreshed. The most advanced spa-exclusive facial for maintaining a healthy complexion. Hydradermie deep-cleanses, rehydrates and regenerates the skin using mild galvanic and high-frequency electrotherapy. A qualified Guinot therapist diagnoses the galvanic gels best suited to each individual skin type making Hydradermie a truly customized treatment. With your lovely wedding gift, I will take delight in the Herbal Bath on my honeymoon. In the serenity of the spa, I will enjoy soaking in a luxurious bath with natural herbs that will rehydrate my skin before continuing with one of my chosen exotic spa therapies. I will indulge in the Yin Yang Massage on my honeymoon at Hilton Hua Hin Resort and Spa. 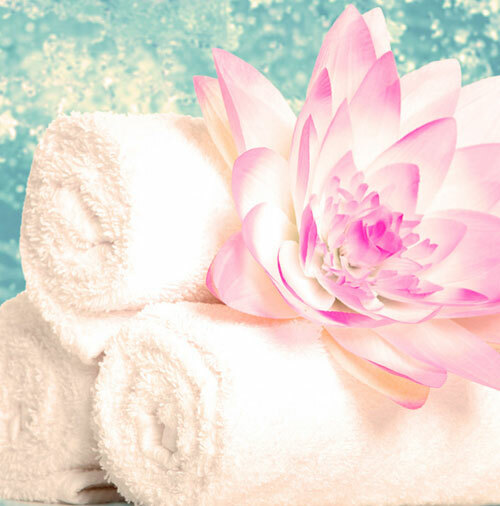 This lavish spa treatment combines relaxation and well being with a gentle therapeutic massage. I will choose from pure natural essential oils to soothe and rejuvenate my spirit. This is a great way for me to ease away travel-induced stress! This is a wonderful holistic way to complete my dream in paradise while on my honeymoon! Hot Stone Therapy will refresh me by using heated black basalt stones that bring about total balance within my body. The effects from this luxurious massage will be simply divine. This ancient Thai art involves the application of force in stretching and bending to relieve tension, soothe tired muscles and invigorate my mind, body and spirit. 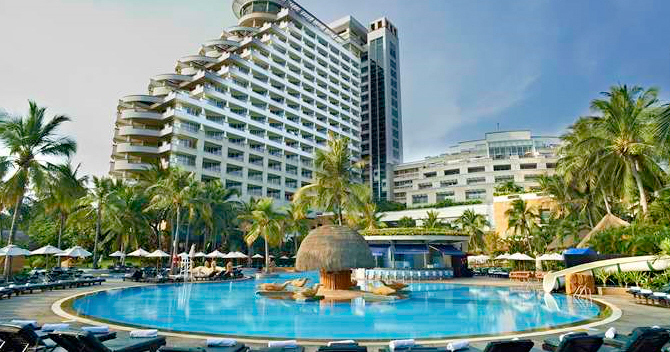 We will celebrate the greatest day of our lives at Hilton Hua Hin Resort and Spa in Hua Hin, Thailand! With your generous wedding gift, we will experience the wedding ceremony of our dreams while our family and friends gather to witness our beloved day. Our on-site wedding coordinator will take care of every single detail for our big day from our ceremony to the reception and all guest arrangements. Whether we are planning an elegant event or an intimate wedding, Hilton Hua Hin Resort and Spa will ensure that our day is pure perfection!